On November 14th 2015, I had the priviledge to do the official launching of my CD Saint-Exupéry: de cœur, de sable et d’étoiles at gala of the 6th Edition of the Festival des étoiles et des ailes which was held at the Cité de l’espace in Toulouse. This short video shows an excerpt of the launching. Festival competition books and films Awards were presented at the gala. Over 500 people attended the gala. The ceremony was held in the wake of the attacks in Paris. At the opening of the event, the audience took a minute of silence to pay their tribute to the victims. The city of Toulouse is particularly touched as they also have been in such a critical situation in March 2012. This was quite moving. 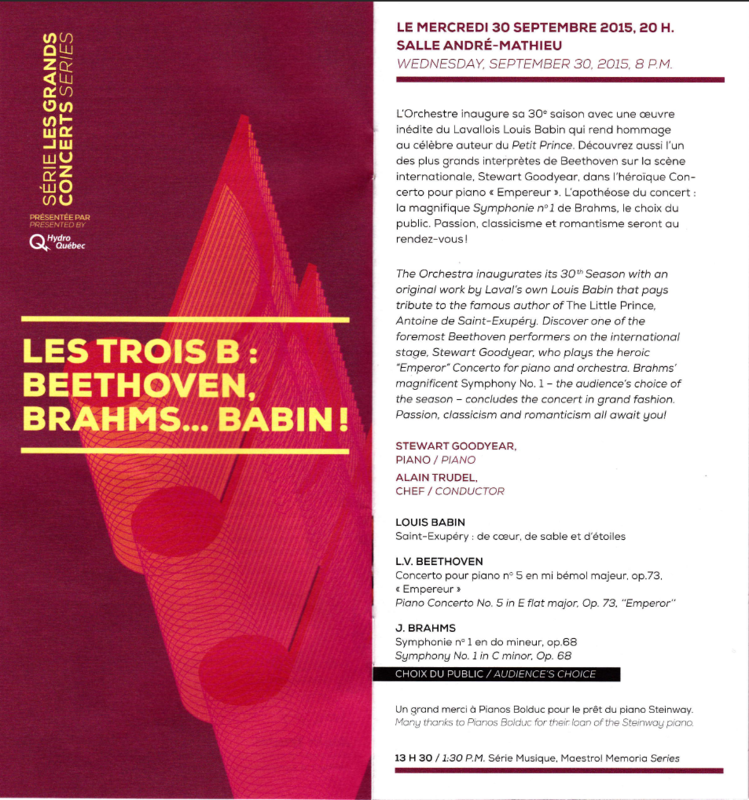 Louis Babin wishes to thank the following organisms : the Conseil des arts et des lettres du Québec for it financial support in order to get to Toulouse; the Festival des étoiles et des ailes for the presentation at the gala and the hospitality; the Foundation Antoine de Saint-Exupéry pour la jeunesse for it participation to the album project. On November 14th, I will have the pleasure of officially releasing my album Saint-Exupery: of Heart, Sand, and Stars during the Gala of the sixth edition of the Aerospace Festival Des Étoiles et des Ailes at the Cité de l’Espace of Toulouse. The Pink City is the cradle of aeronautics and spatial exploration in France. The annual gala takes place under the patronage of Alexey Leonov, Soviet cosmonaut, Michel Tognini, test pilot and astronaut, Jean-Luc Moudenc, mayor of Toulouse, president of Toulouse Métropole and president of the Cité de l’Espace, as well as Catherine Gay, president of the Association des Étoiles et des Ailes. The Saint-Exupery Youth Foundation, to which I donate part of my album’s sales, will also be present. During the gala, I will present my symphonic poem, inspired by the life and work of author and pilot Antoine de Saint-Exupery. The 300 guests of this VIP soiree will then hear the first movement of my work and be able to purchase a copy of my album. The Saint-Exupery album will also be available for purchase at the Comic and Book Fair of the Festival. It will also give me the opportunity to meet some of this unique festival’s 25 000 annual visitors . Another good news, the official virtual Le Petit Prince Shop now sells my album. It offers international shipping. 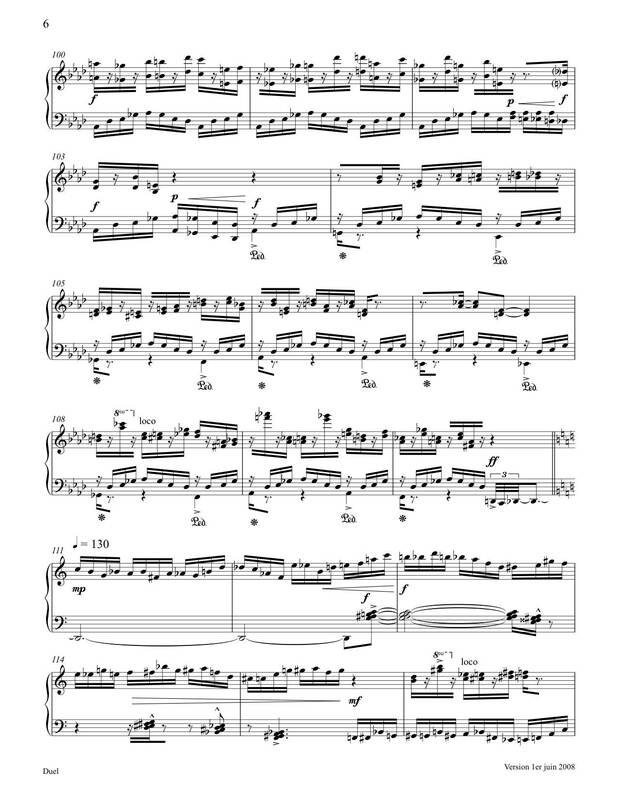 My friend Frédéric Metthé got the touching idea of putting beautiful moving cloud’s images on L’extase, a mouvement taken from my Suite du promeneur, for strings. I love to look at the sky quite often and I observe with always renewed amazement the breathtaking views of the clouds everyday. I invite you to take two minutes to view the video. 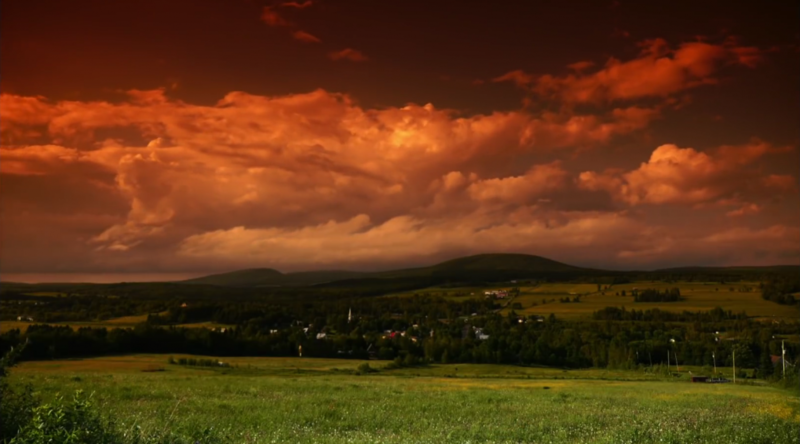 Immerse yourself into the beauty of the clouds pictured at different times of the day with my musique to support it. To know more about Frédéric Metthé, an artist and a friend with colourful works. To listen to other preview of La Suite du promeneur. Mæstro Alain Trudel and the Orchestre symphonique de Laval (OSL) are programing Saint-Exupéry : de cœur, de sable et d’étoiles for the opening concert celebrating their 30th Anniversary. It is a true priviledge to be played by the orchestra of you own town. Huge thanks to Alain and Marie-Pierre Rolland, General Manager of the OSL. Here are some reviews about the piece founded on my CD Saint-Exupéry : de cœur, de sable et d’étoiles and Other Works. I will keep you posted as soon as the tickets will be available. 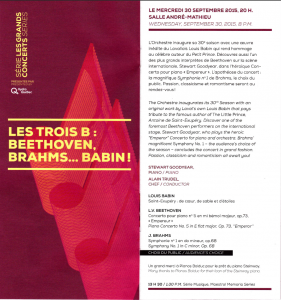 On May 5th, conductor Boris Brott will introduce La Suite du Promeneur to the McGill Chamber Orchestra’s program. 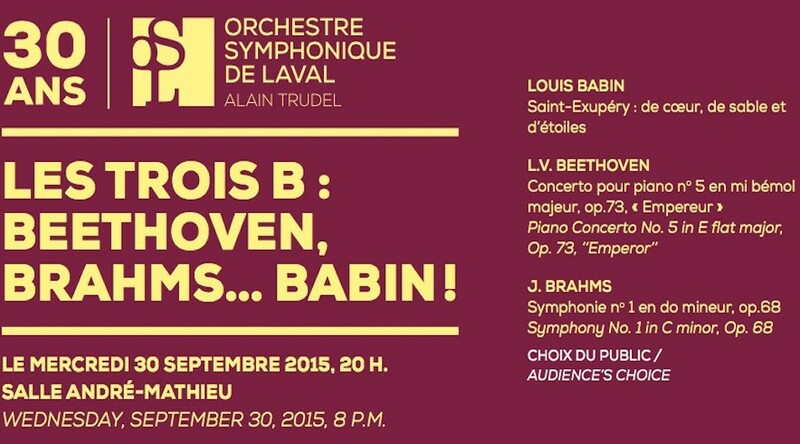 Louis Babin and Brott will be reunited 23 years after the work’s initial creation by the Orchestre de l’Isle, which the maestro conducted at the time. The concert will take place in the magnificent Montreal Museum of Fine Arts’ Bourgie Hall at 20:00. 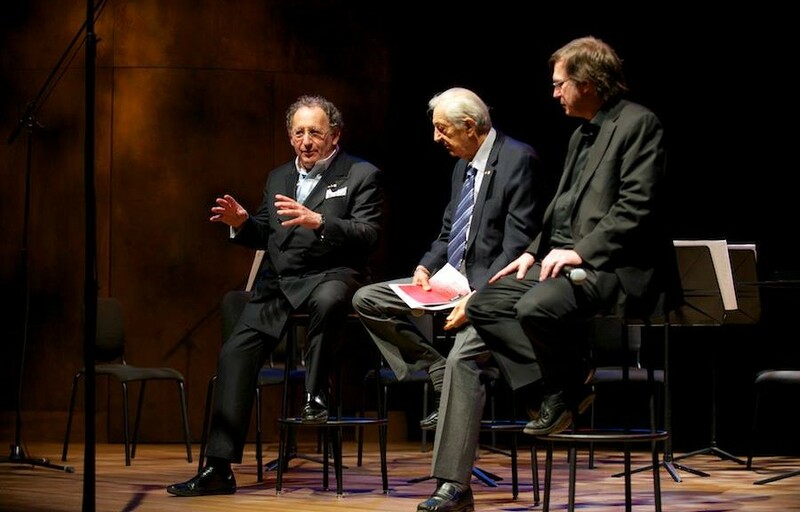 Boris Brott, Louis Babin, as well as Belgian violinist and guest soloist Marc Bouchkov, will take part in a discussion preceding the concert, at 18:30. Bouchkov won the First Prize at the 12th Montreal International Musical Competition. Selected works by Haydn, Mendelssohn and Tchaikovsky will also be performed.